What can you do? Read this book! Sitting hear letting a completely local (average food miles was 50 yards)- potato based skillet breakfast settle. All of it, minus the garlic which just finished curing, picked fresh this weekend, and much of it this morning in my slippers. Included were peppers, tomatoes, sorrel and garlic chives-and we are one day away from October. I am still attuning myself to the rhythms of Nature as I delve deeper-but our average first frost date is less than 5 days away and the high yesterday-heck all of last week-was in the 80’s. The problem with Global Warming is that this could just be an “Indian Summer”. But we are on the 4th week without appreciable rain (again), and while the rain for the summer looks only slightly less than normal, 90% of it came in a 10 day period in the middle of 14 weeks of almost literally zero rain at all. It is an interesting time to become a farmer. The new farms must find ways to mitigate these extremes, but that is for another post. As the Doing Season is drawing to a close and waxing into the Reading Season, I stopped by the library to see what they have been up to-its been 4 months! The head librarian was really excited about a recent purchase for the Sustainability Library we started this past Spring. A quick flip through it and I could see why-the book was gorgeous-at first blush it appeared to be a cook book: dripping in glossy photos of fruit, food, and bucolic scenes of children in gardens with only brief text with alot of bullet points. Then I read the intro-and it turns out I was not far off. The book is essentially a recipe book for how to reduce your impact. How many of us have had someone say “What Can I do?” I often give Big Picture answers: drive a more fuel efficient car, buy organic, etc but what many really want is something more concrete. The book is broken up into 3 sections-based on how much land you have starting with living in an apartment and finishing up in a large suburban lot or even a small acreage. Each section contains ways to grow your own food, cut your waste stream, and reduce your energy use. Many feed into the next-apartment dwellers are offered ways to make eco cleaning detergents out of vinegar and baking bread, which of course applies to all of us. Suburbanites get a glimpse of heating water with the sun, and by the time you get to the acreage section you are learning about raising dairy cows, making butter in a food processor, and planting orchards. value however along the change curve you are. I will be purchasing this book to loan/give to the next person who honestly asks “What can I do?”. With its immenently accessible approach and pages laced with optimism and Can-do-it-ness without a trace of preaching, doom or gloom it has a real chance of inspiring change. My Eco Mia puts it best. I know that Whole Foods is contentious. Many of you also know that I detest the “Lamers”… those on the Left that spend their energy dragging down those people making real solid changes in thier lives or businesses to make the world a better place because they aren’t doing enough. Can we do more? Yes, we can always do more. But the world will be made a better place by helping and building, not hurting and destroying. I stand with those who help and are actively Being the Change. Today is one of my favorite days of the year. The Autumnal Equinox is particularly special, even holy, to us. I am not an overly spiritual person, but September/October are fabulous times-the harvest is still in full swing-my sunchokes are cresting 8′-and while there is a nip in the air during my 5am commute I can still pick tomatoes and peppers. It is a beautiful, magical time. Today was also the final installment of a 6 month long intermittent training program I was participating in at work. Together with another 40 execs from our region, we got together 3-4 times to discuss career development, give/receive feedback and network. This is real Fortune 500 stuff that I tend to isolate from my blog, but during the sessions I (being me) had worked enough permaculture stuff into some of the discussions that 2 of the members of my group were up from IL asked for an “eco-tour” of my property after we wrapped up. We took the short version (under an hour) of the tour, and as I explained my permaculture guilds, rain barrels/gardens, bio-cisterns, and native plantings we grazed along the way. They were amazed that at almost every stop I was able to bend over and pluck a leaf off a plant, pop a tuber out of the ground, a berry from a bramble, or fruit from a vine. They commented on the simple elegance of the rubble rock walls and the frugality of the municipal wood chip mulches-and were then fascinated at the functionality of the rocks storing heat to serve as season extenders, and the mulch as a substrate for edible mushrooms and provide food for a complete soil ecosystem. When I answered their question that I had harvested over 500# of produce this year and hoped for 2000# within 3 years they were stunned. They know I work the same jobs they do-they knew that they could do it too if they wanted to. And that is what my HOA Permaculture is all about. Imagine if I hit my goal of 2000#. Imagine if my entire subdivision of 50 homes did the same (100,000#). Then take that out to my little village of 1200 with its 500 homes and you get darn near 1,000,000 pounds of food. All from homes that still have lawns and play systems and decks. From the street it would look like we all just have well landscaped homes. But a walk through that landscape and you realize that virtually everything is either edible, or supporting a plant that is. As I said in my last post I am spending alot of time on the web researching for next years more significant foray into organic market gardening. Currently I am focusing on 2 main aspects-biological pest control and building long term fertility cycles through cover cropping, rotations, and a more scientific approach to composting. A favored launch point this week has been the Permaculture Activist Magazine’s website, specifically today their Plant Lists. They have several distinct branches-seeds, fruits/nuts, tubers, and growers supply. The catalog for their trees reads like a primer on orcharding and is over 62 pages long (available online). Their tuber line is dubbed Moose Tubers and besides offering 47 varieties of organic potatoes, they have (be still my heart!) 3 varieties of Sunchokes! Each variety gets several paragraphs of text as well as an extremely helpful chart listing all the potato varieties together showing harvest time, tuber shape/size, average yield, and lots more. Pricing is very reasonable-I can get 100# of Purple Viking shipped for about $180. Considering that should be enough to grow 1000#+ of potatoes $.18 per harvested pound seems pretty reasonable. 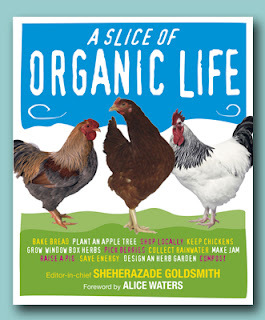 In their Grower’s Supply section I came across two books, Compost, Vermicompost and Compost Tea: Feeding the Soil on the Organic Farm & Manage Insects on Your Farm: A Guide to Ecological Strategies both are rocketing to the top of my reading list. Here is an entire book devoted to my dabblings in interplanting flowering plants for beneficial insect attraction-and one that is focused on soil management on a commercial scale. Priceless! And, yes, I realize I am a dork. We begin cutting the beds in a few weeks, and the adventure will begin with 800 sq ft of garlic. 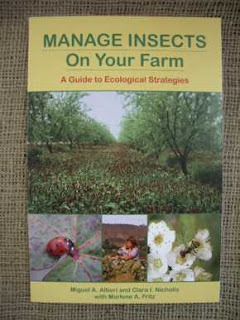 By January I should have a firm starting plan on crop rotations, insect management, and soil strategies that I can present to the land owner, and then modify after consulting with my customers and the restaurant (where I am currently typing this with my daughter reading beside me) I will be selling to to dial in cultivars and sq footage. With the land deal made my mind (to no one’s surprise) is in hyperdrive. I think I have read half of the ATTRA site in the past several days, worn the pages of my Seeds Savers and Seeds of Change catalogues down to nubs, and have spent an inordinate amount of time drooling over equipment sites that no good can come from like Earth Tools, and others that actually make sense like Scythe Supply. It is that last sight that has tickled my muse this morning. 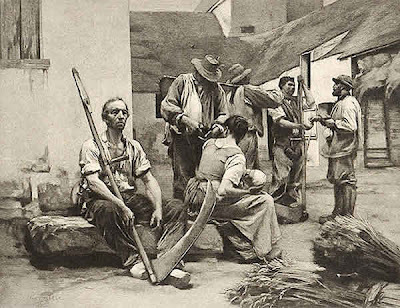 This 1890 scene was found on the Scythe Supply’s site-and is titled “Paying the Mowers”. What has me going is that here are a half dozen grown adults receiving their wages for mowing. Someone who knows their way around a scythe can reportedly mow about an acre a day. Now imagine paying in today’s wages about $100+ to have each acre of your pasture/orchard/lawn mown. It would be ridiculous, but considering that was the way of things barely 100 years ago it bears thought. With this in mind it is not hard at all to see why rural America is dead or dying-population densities lower than when the Native Americans had the run of the land and the rural youth in full flight to more favorable climes. This flight is redefining our country and forcing the vast majority of our food to be grown by drivers instead of farmers. I realize I am waxing nostalgic here and glossing over an immense amount of things like cholera, social security, and botox, but there was a time when this country paid just wages for things that mattered-like putting up the winter’s hay for the dairy cow-rather than KitchenAid mixers or LCD screens. As Polan and others have made clear to larger society, we currently pay less, as a percentage, for our food than any other culture in history. So not surprisingly we treat that food as a commodity valued by cost alone with hardly any consideration to quality. As a society we will spend weeks agonizing over which digital camera to purchase, but spend little to no time reading the ingredient list of the cereal we feed our children and caring not at all about the farmer that grew the grain, or the workers that packaged it. This past year I have tasted a sweet new fruit-that of receiving part of my wages from growing food or crafting items (rain barrels) with my own hands. Given that I charge just prices (about 3x the grocery store) for my produce and products, my customers would not be purchasing it if they did not value it, and what it stands for, more. I take great pride in having a neighbor choose my produce to serve in their restaurant or to feed to their family. Our rural economy was once based on neighbors providing products and services to each other. That interconnectedness bred community and a level of dependence. You paid just prices to the smithy or mill-if they folded who would repair your wagon or allow you to make bread? Why should today be any different? Our family will gladly pay more for local business to keep that business local-be it a bakery, repair shop, hardware store, or famer’s market. We have the power of the purse to make our community economies what we value. Given that statement there is palpable irony in the fact that the closest vendor listed in first paragraph is over 400 miles away. The facts are that the 21st century community will be different than the 19th. Scythe Supply, Seed Savers and others are a critical component to building the future that I desire, and I will support them. But where the local economy still exists I turn to it- my garlic “seed” was purchased locally, we have sought out local coffee roasters, brewers, and cheesemakers, and Wisconsin has some of the finest farmers markets in the Midwest. I guess I am proposing that we think hard about which mowers we are paying in our lives, and thereby ensure that those mowers will be there come the spring cutting time. So I am still riding high from this Saturday past when the deal was made-I have land to use next year! But even on the way home my gears were turning. Where in the sam hell would I be putting 600#’s of potatoes next July? As luck would have it a friend I had made this past year was in the middle of restoring an old farm house in town and had uncovered and rehabbed the original root cellar. I shot him a quick email and asked him to stop by if he got a chance. He is up for swapping 40# of potatoes or so for use of the cellar, so it looks like whatever we are unable to sell we will be able to store well into winter, while also helping to keep another family well supplied with locally grown calories. So the Beo Farm Community grows: 1 family to own the land, their brother to run the tractor, another to plant and tend the fields, and still another to store the surplus. 3-4 families sharing resources to create thousands of pounds of local food were there would be none without community. All this grew from the simplest of things-the courage to ask a neighbor if they would be interested in sharing a resource. What other bounties are unrealized every day? Ask for help, Give some help. This afternoon I finally met with the local small farm owner to discuss using some of his land. On several sides it is better than I imagined. The plot we agreed on is about 1/4 of an acre and which will make about 20 beds (4×100 with a path)-I will probably only use 5 at most the first year. One-its free. Yes you read that right-at least as money is concerned. I will be sharing the produce, helping with some with chores, and I wouldn’t be surprised if a rain barrel doesn’t show up at their home, but no money will change hands. Secondly they owners will prep the beds for me with a tractor mounted rototiller. The tiller will make 50″ beds with 18″ paths in between that I will cardboard mulch and layer with wood chips. This is especially good as the area was allowed to fallow and the quack grass is thick. Thirdly, I have access to water, wheel cultivators, and a storage shed/root cellar to store the produce in. They even have fencing for me to use to keep their gaggle (well over a dozen) of geese out of the garden. Finally, I have the invaluable oppurtunity to learn innumerable things about farm steading just by being on a working permaculture farm. Just today I helped the owner use hand tools to skin a huge 40′ log he felled this week that will be used to make the second story of his home in a year or two. Sound difficult? It only took about 20 minutes using some heirloom tools he bought at an old estate sale. It was incredibly beautiful to see those old tools put to use again. So it begins. My path down the road to small scale ag couldn’t possibly have started in a more optimistic way-sharing labor, tools, land, and knowledge with neighbors and nary a contract or check in site. They have the land -we share the passion- and I supply the labor and seed. Together we will make something special that was not possible without our community and one generation of small farmers helping the next. It will be an adventure as I learn to scale my thinking from gardening to farming. Last week, I was excited about the daunting prospect of planting 400 cloves of garlic-they will be putting in 800 sq feet in about a month-even at the 6″ spacing they use for ease of weeding, that is something like 6000 cloves of garlic-enough for over 100 families!! !